Stick ’em up – or just stick ’em! The Old West meets the Rigid East on a collision course with wackiness! Is it a Samurai Western or a Western Samurai movie? RED SUN: a unique action-adventure that is all six-shooters and sushi. 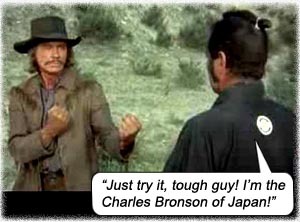 Across the American western landscape, outlaw gunslinger Link (man’s man Charles Bronson) and samurai Kuroda (Japan’s Man, the mighty Toshiro Mifune) chase down a stolen sacred katana, in an uneasy alliance that is both comedic and infused with honor. Kinda like George Clooney and Chris O’Donnell in BATMAN AND ROBIN. Before SHANGHAI NIGHTS, this first teaming of a cowboy and a martial artist in this road movie/buddy picture proves a constantly intriguing dynamic. The sword was stolen by one of Link’s own gang, the double-crossing Gauche (Alain Delon); Kuroda has been given seven days to retrieve the sword for Japan’s emperor, and Link wants to catch Gauche to retrieve his share of the heist. Link continually tests Kuroda’s manliness and patience in trying to lose him, fight him, bargain with him, and Kuroda regards Link as an undisciplined hooligan with nothing but a gun in lieu of true manliness and honor. Along their feuding way, they run into – D-cups! Ursula Andress (World’s First Bond Girl) as Christina, squeeze to both Link and Gauche at one time or another, brings her nakedness and the womanly need to get rescued from Natives at some point. In the final tearjerking shot, Link actually shows the type of man he truly is, and displays something which we imagine he has never exposed before for any man or woman – his honor. A hanging katana marks the spot. Writers: Laird Koenig, Denne Bart Petitclerc, William Roberts, Lawrence Roman. Starring: Charles Bronson, Toshirô Mifune, Ursula Andress, Alain Delon, Capucine, Barta Barri, Guido Lollobrigida, Georges Lycan, Tetsu Nakamura. I remember watching this movie on TV at around 12-13 years of age, and when Ursula Andress unexpectedly and quite deliberately took her shirt off – with NOTHING on underneath! – it was the first time I unexpectedly felt an actual tenting of my little cucumber trousers. A remarkable feeling, realizing all at once that those things of hers were directly linked to my kundalini in some metaphysical way!